Info "Defeat beasts! Get loot! Yes!" WarioQuest is one of the Job Center's microgames in WarioWare: D.I.Y. After completing Mona's set, Wario comes to the player and requests them to create a scary monster for his game. 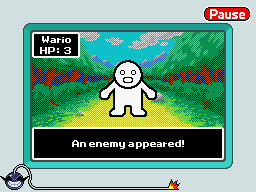 There is a sequel to this microgame called WarioQuest 2. To win the microgame, the player has to defeat the created monster by tapping it three times. If it isn't defeated when the timer expires, the player loses the game. "I'm the hero in a fantasy RPG! What I need from YOU is a big, burly monster for me to beat up on!" This page was last edited on July 25, 2018, at 18:04.